Dublin has a feast of festivals to offer this Autumn. Enjoy spectacle, art and literature at Parnell Square Cultural Quarter and Dublin’s north city. The Bram Stoker Festival (27th – 30th October) is inspired by Dracula, Dublin-born writer, Abraham -‘Bram’ Stoker’s most famous novel. This year’s programme brings events such as DEAD AIR at Belvedere House, a live, theatrical, horrifying homage to the Golden Age of classic radio horror, when chilling tales of the macabre crept into our living rooms through the crackling wireless. 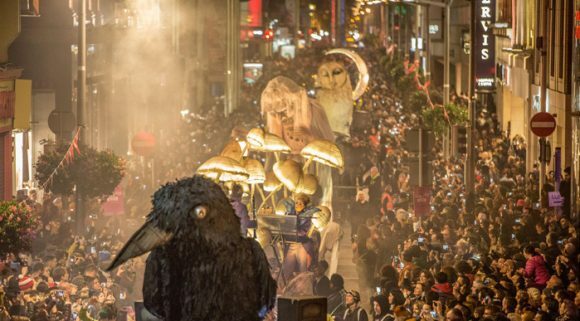 Macnas, world-renowned pioneers of imagination and invention, will bring a hauntingly beautiful, wild and tempestuous parade, Memory Song, through the broad and narrow streets of Dublin’s Northside, starting at Moore Street at 6pm on 30th October. Dublin Gallery Weekend (23rd to 26th November) is a city-wide collaboration of almost 40 art galleries and museums across Dublin. A specially programmed series of free public events invites visitors to come and experience something new, and to discover art in galleries of all types ranging from the biggest modern art museums in the country to the smallest, tucked away experimental art spaces. Two of the participating galleries are on Parnell Square – Dublin City Gallery The Hugh Lane and Hillsboro Fine Art, with others such as Olivier Cornet Gallery, The LAB Gallery, Oonagh Young Gallery and Artbox only a stroll away. Enjoy the Dublin Book Festival which runs from 2nd – 9th November this year. Dublin City Libraries are delighted to feature a dedicated children’s and schools’ strand as part of the festival programme at selected libraries across the city. The Irish Writers Centre’s ‘Takin the Mic‘ is joined by Poetry NI for a special edition of the monthly spoken word open-mic at Smock Alley on 3rd November. Jonathan Swift’s life and legacy is celebrated in Swift 350, the Jonathan Swift Festival, (23rd to 26th November), run by Saint Patrick’s Cathedral, Dublin, in collaboration with a number of cultural institutions across the capital including the Irish Writers’ Centre and Dublin City Public Libraries.